Passengers are welcome to board our ship at 3:00 p.m. We'll set out to discover the Christmas markets in Strasbourg with our hostess. After returning on board, we'll introduce our crew at a welcome cocktail before dinner. Enjoy a "Christmas Tales”-themed evening. We'll spent this morning cruising. Once in Braubach, join us for a guided visit of Marksburg castle, which has remained intact over the centuries. Enjoy a "Christmas Carols"-themed evening. Enjoy some free time or join us on an excursion: Guided tour of the Museum of Mechanical Musical Instruments in Rüdesheim. The afternoon will be spent cruising towards Speyer. Tonight is our Christmas Eve dinner and evening. Midnight Mass will celebrated in Speyer or Worms (1-2). 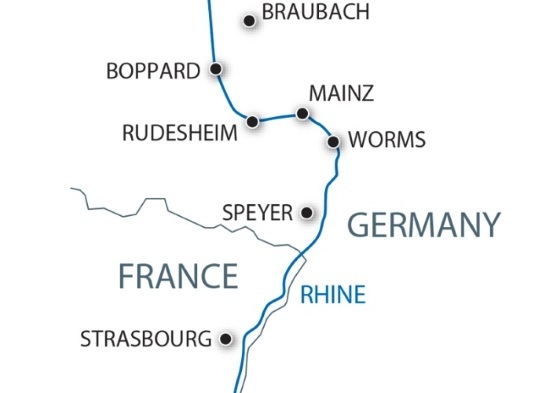 The whole day will be spent cruising on the Rhine towards Strasbourg. Tonight is our gala dinner and evening. Enjoy one last buffet breakfast on board before disembarking at 09:00 a.m. End of our services.